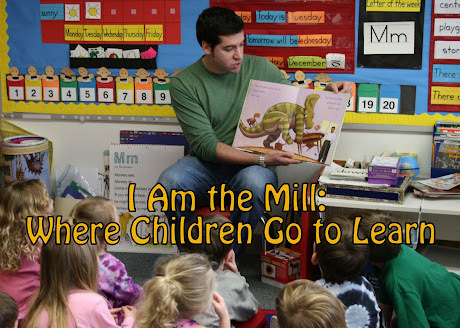 I Am The Mill: Are You Ready For Some Football? You're goddamn right I am. Thanks for asking. Finally, the 2007 NFL season is about to begin. It's been a difficult, lonely, and confusing 7 months since the Super Bowl. And as I gear up for another edition of my favorite sports season, everything is beginning to make sense again. The beauty. The brutality. The strategy. The highlight reels. The tight pants. This is what it's all about. But what it's really all about for millions of fans, is the coinciding kickoff of the fantasy football season. If you haven't played, you should. It's awesome. You get to pick your players from the actual rosters of every NFL team. And when the players on your fantasy team do well, you get to feel smart for picking them. I've always suspected that I have some sort of magical effect on the outcome of every game I watch (see my post from 9/17/06 for more on my otherworldly powers of influence). But with fantasy football, you also enjoy the feeling of having an effect on your individual fantasy players' lives. Both on and off the field. Maybe if I had drafted Chris Henry one round earlier, he wouldn't have received his 3rd DUI in a year. Or at least he wouldn't have gotten caught. I also suspect that the guy who had Michael Vick on his team last year must have done something fiendish in a former life. After all, this is a keeper league, and now he's without a quarterback. That's some serious retribution for both him and Vick. In the end, nothing I do or say can guarantee a fantasy football championship. But I like to stack the deck in my favor, as much as possible. 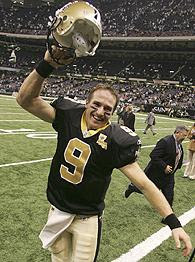 To that end, I've decided to send an email to my starting fantasy quarterback, Mr. Drew Brees of the New Orleans Saints. Cool Brees was a godsend last season, throwing for like 500,000 yards, and maybe about 25,000 touchdowns. Or so it seemed at times. He was totally magnificent. I'd like him to know that I'm a big fan. Also, I want to make certain he understands the importance of consistently scoring a whole lot of points, both from season to season and game to game. This is especially important in the fantasy football world. If I can't count on him, he's worthless to me. And I'll dump him as fast as he can snap an ACL. As opening day relentlessly rushes towards us, I thought I'd take the time to send you a quick note, full of well wishes, and a bit of advice. But before I go any further, you should know that I'm not some sort of Monday morning quarterback, and have never doubted your ability to read a defense. I don't second guess you, Drew. And all I ask is that you read my entire message, and at the end, reflect for but a minute on what I have to say. My advice is not the result of you having disappointed me in the past (except for Week 15 vs. the Redskins and Week 13 vs. San Fran last year) but rather, some well-intended kind counsel for a fellow human being. Drew, everyone says that football is a team sport, much like soccer. Which is what the rest of the world calls football. And that simply causes confusion for everyone. So, why not make our American football a bit more of an individual endeavor? The other sport called "football", the one that people get murdered over in Colombia, can be a team sport. Thus, we have relieved much of the confusion, as one will be called Individual Football, and the other Team Football. Our Football should be full of individual accolades, personal record-setting, one-man touchdown celebrations, etc. By striving to achieve more individual goals, you'll be helping to make the world a better place for every sports fan. You should also strive to carry the "team" on your shoulders. After all, the "team" is nothing more than a sweaty locker room full of enormous athletes with even larger egos. Drew, you need to rise above all of that. You need your ego to carry you to the next level. I believe that level to be 5,000 passing yards, and 45 touchdown throws. Do you have any idea what that type of production would do for you? And for my fantasy team? But mostly for you? You'd be a superstar. You'de be able to renegotiate your contract. Wheaties boxes, cover of GQ, you name it. An exercise to help you focus on individual performance - consider this scenario: 3rd down and goal from the 4 yard line. The coach calls for a quick screen pass to the tailback. But you know that the last thing the defense would expect is for you to fake the throw and run it in yourself. Also, you might happen to know that a passing touchdown is only worth 4 points to my fantasy team. Whereas a rushing touchdown is worth 6 points. So why not keep the ball and run it across the goal line? Everybody wins. Especially you. Unless you get tackled and seriously reinjure your surgically-repaired shoulder. Then we'd both feel like assholes. It would also be great if you could return kickoffs, and throw a touchdown pass to yourself. Quarterbacks don't typically do those things. Can you imagine how cool that would be? And how those fantasy points would rack up? Don't you want to be unique? All I ask, again, is that you briefly contemplate my friendly words. For your own sake. Nice touchdown pass to yourself Drew! Wow! Look how happy you are! Good luck to you, dear Drew. May you remain healthy and wealthy, of both body and soul. And Drew, maybe just a couple touchdown passes to yourself now and again? For the children. They'll be watching. As will I. Except during your bye week. Or if you happen to get injured.